Update: As expected, President Trump will veto the bill, as expressed in a one-word tweet on Thursday afternoon. 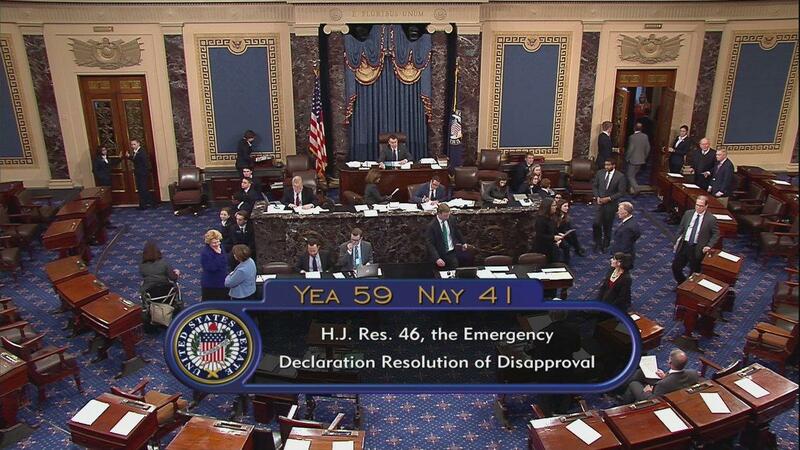 The Republican-led Senate has voted to block President Trump's emergency declaration to allocate funding for a southern border wall by a margin of 59-41. Trump has promised to issue the first veto of his presidency, which the Senate lacks a 2/3 majority to overturn. A big National Emergency vote today by The United States Senate on Border Security & the Wall (which is already under major construction). I am prepared to veto, if necessary. The Southern Border is a National Security and Humanitarian Nightmare, but it can be easily fixed! "I'll do a veto. It's not going to be overturned," Trump told reporters on Thursday. "It's a border security vote." While Trump has framed the border crisis as a matter of national security, Democrats and some Republicans argue that his Feb. 15 national emergency to circumvent Congress over border wall funding is unconstitutional. Twelve GOP senators broke with President Trump, joining Democrats to overturn the national emergency declared last month. The vote on Thursday pit Mr Trump against some of the most prominent members of his own party and will force him to issue the first veto of his presidency if he wants to proceed with taking money from other federal agencies to fund wall construction. In addition to some Senate Republicans who have bucked Mr Trump in the past like Maine’s Susan Collins and Alaska’s Lisa Murkowski, Thursday’s 59 to 41 vote saw a wider array of party stalwarts turn against the president, including Utah’s Mitt Romney. "This is not a vote against border security," said Romney ahead of the vote. The Utah senator argued that he was concerned with the precedent which would be set by the White House using an executive order to move forward with a policy widely rejected by Congress, adding "For the executive branch to override a law passed by Congress would make it the ultimate power rather than a balancing power." Trump did not answer when reporters asked if there would be consequences for Republicans who went against him - however a White House official said that Trump wouldn't forget when senators ask him to attend fundraisers or provide other help, according to NBC Bay Area.